Going back a few months I was in contact with the team over at Sky Relics, who were in the preparatory stages of their march (or should that be sail?) towards Kickstarter. The guys had engaged with members of the gaming and blogging community to run a painting competition using samples of their models, to raise awareness of the game on their journey, and it was a lot of fun and a privilege to take part in. They were kind enough to answer a few questions for me at the time. Since then, the team have gone through their Beta phase, done a stint on the convention circuit, and generally got their name and their game out there for people to see. 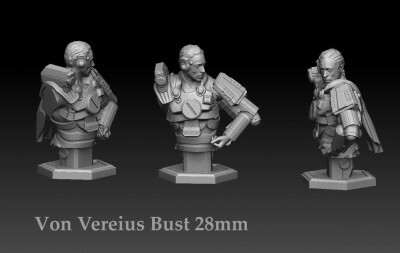 The focus of the Kickstarter has shifted from the all-encompassing tabletop RPG that was originally envisaged, to focus initially on the tabletop wargame aspect, and the RPG and campaigning element will come later on down the line once the wargame core is out there. Now, finally, they are ready for launch. Ladies and Gentlemen, Captains all, the Sky Relics are going to war! With the Kickstarter going live in a matter of days (November 17th), and lots of juicy artwork and 3D renders emanating from their Facebook and Twitter feeds, I thought now might be a good time to get in touch with them again as they batten down the hatches and prepare to hit that big red button. 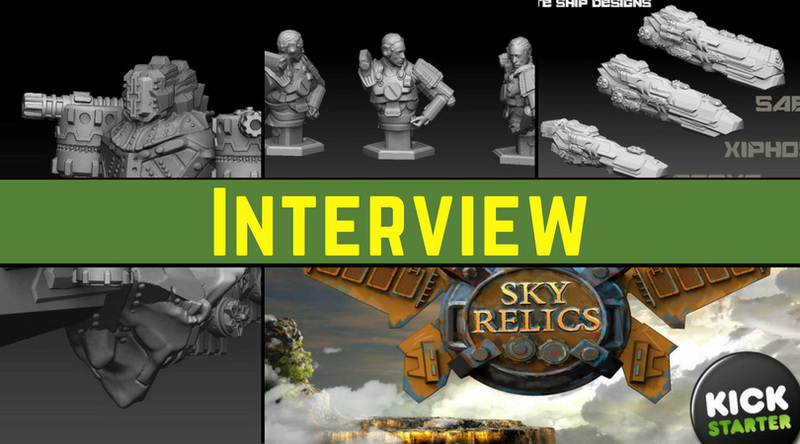 Below is the interview I was lucky enough to be able to conduct remotely with Derek Heath, 3D Artist and creator of Sky Relics, the game, the setting, and source of the passion and drive behind the project, who managed to find enough time in what I am sure is a very busy few days. Derek, what do you think has changed in your approach or outlook since your first journey down the Kickstarter path with the Sky Relics game? Well I was trying to give everyone too much at first, the world I created for the setting is large with a deep history. The number of different ships available was substantial. The game I wanted players to enjoy included too many elements, so people struggled to understand what type of game it was meant to be. 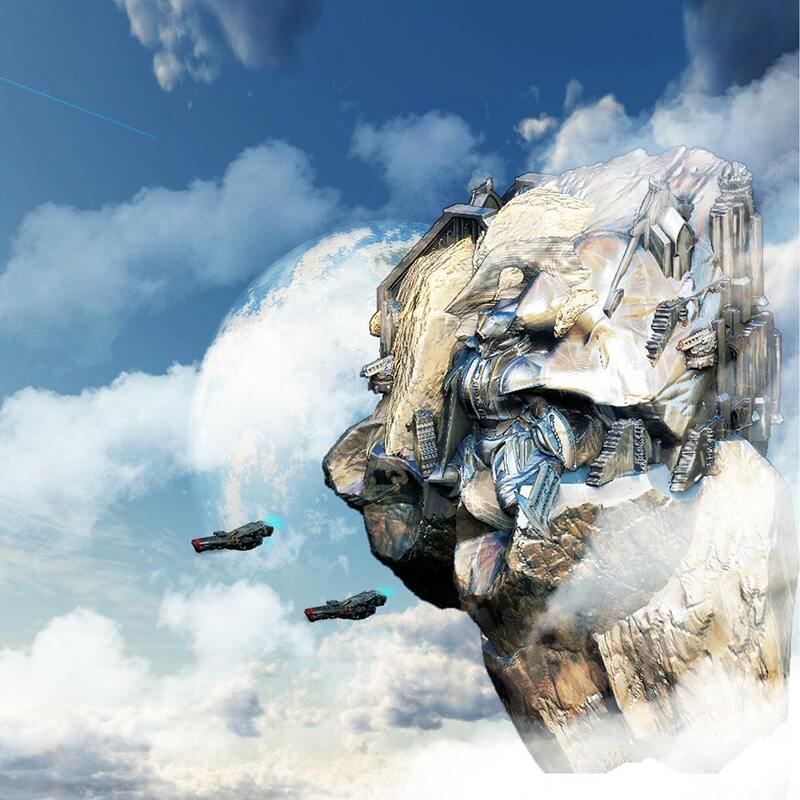 What I needed was a platform that could grow with the business, from a simpler and cleaner jumping off point, so the plan first is doing the wargame, and then add to the game world with other forms of game play. What do you think there is to learn from other companies successful Kickstarter projects that will hopefully allow you to succeed with yours? I think that success comes in many different levels, and the kickstarter projects that deliver the product are the winners. Now they might not be very profitable initially, but they get their game onto the market, which is the big win. We are planning a kickstarter with many backup plans, in case the funding goes to the skies. I have already gotten quotes from manufacturers that will help with mass production. I know the numbers, and feel that if we hit those numbers everyone will be very happy. I also think as a start-up company when I started the first couple of kickstarters I was afraid of success, because I didn’t know how to deliver that many castings. After few conventions and making few thousand ships, I know what’s needed to get it done this time. 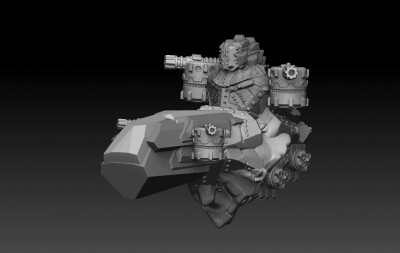 How have the rules and miniatures developed over the course of 2017, and what has driven any changes?As a 3D designer I have learned so much in these last couple of years. 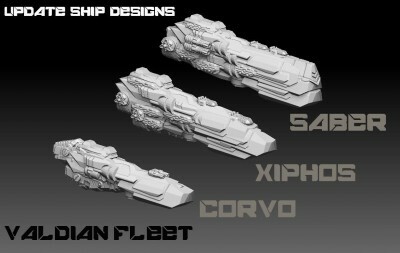 I love ‘Zbrush’, and my ships do have their own look, love them or hate them, they are original designs. With the game, I played tested the first airship game over 13 years ago with the d20 system which worked great back then. I wanted to do the same thing now. The Beta starter set had used the d20 system, but I found it just doesn’t work well for the wargame side with large fleets, so I went back to the D10. For one thing, the d10 itself rolls better then d8’s and d12’s, and what we were working towards was a game system with capacity for growth. After months of playtesting, we found it. I am happy with the system now. I feel it offers some great tactical decision-making, and with ships having actions to spend on what kind of attack they make, or using them for extra movement, makes this game very different. Barbarian, Elf, Dwarf or Wizard? 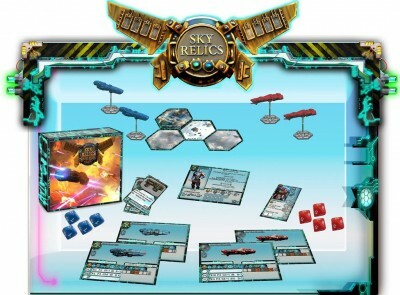 What makes the Sky Relics game as it stands different to games that may look superficially similar, such as Battlefleet Gothic and Dropfleet Commander, because presumably these games would appeal to the same market as Sky Relics? Both of those games are great in their own ways. With the crews and the boarding actions, and great mods (modifications), the ships can have to make the ships feel special and unique, Sky Relics ships are ships with character. If anyone has talked to me in person, then they will know I love navy ships. My father is old submariner, US navy from the late 50’s to the 70’s, and then he worked on the submarines in the Shipyard of Mare Island CA. Growing up, I would hear those sea tales of the life on the subs. In fact, two of the subs my father served on are ships in the game; the Mighty CUSK and the HADDOCK. I love my Father and I wanted to honor him with these ships, and he loves the designs. So, in the world I made the atmosphere is so thick, and the gravity low it’s like water, and ships are more like flying submarines than aircraft. That’s why the ships can’t leave the atmosphere, and if a ship flies too low, they plummet to ground of Targus! 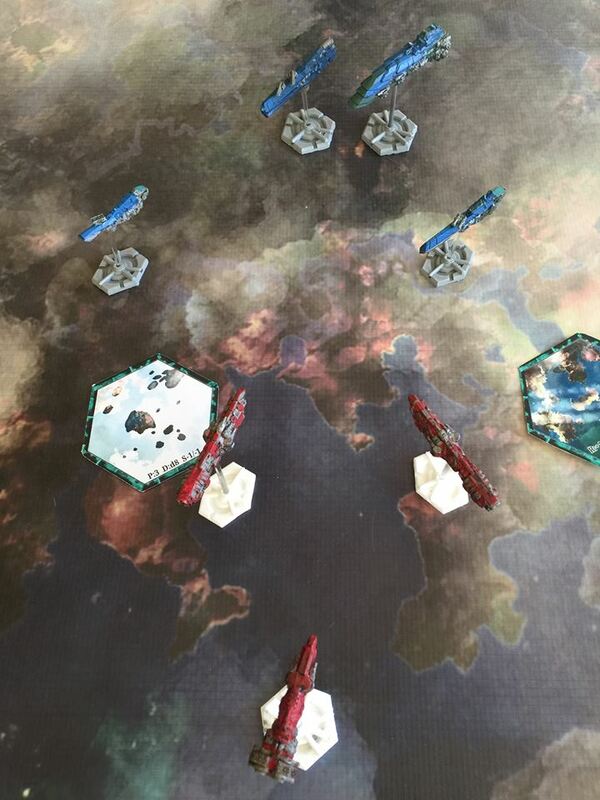 Are there any rules mechanics you are particularly happy with?Yes, I love the actions the ships use to give players so many different choices in each game round. I have been playing the Mals of late, and the Mals are mid range warriors for the most part. I had to spend an extra action to boost my attack to shoot at long-range so I could reach the Sky Knights ships. This did two things; that extra action gave my ship extra range, and with a +1 to the gunnery skill making the gunnery skill 8, and so I needed 8 and up’s to hit, but when they connect, the Mals do great damage, again my choice. Have you ever backed a Kickstarter project yourself, and if so, what was it and how was your experience?Yes, I have backed few Kickstarters and have great fun playing the games as well. So far I have received everything that was promised. I love idea that many of these games may have never made into my home without the aid of Kickstarter. Kickstarter gives game developers a chance to get their game into the hands of the players, which is of course the end goal. Please could you tell me for potential backers, if you can, what the Kickstarter will include, and what plans you have for further releases after the Kickstarter is concluded and fulfilled? The various stretch goals will hopefully unlock lots of cool extras, such as rare vessels, and at higher pledge levels the rule book will be hard copy high quality printed, and even hardback, rather than the base level PDF version which is there to keep costs down for those that want to get involved with the least outlay. What is currently your single favourite thing about Sky Relics? That’s a tough question! It’s like saying to a parent ‘who is your favorite child’, but I can say I love the setting right now, and as time moves on in the game world technology is lost, and ships need new parts to fly, and Skyships become Airships. With the Kickstarter going live in a matter of days, what would you like to say to anyone out there that may be considering jumping on board?I am prepared to deliver a great game. I have done my research, I know my numbers in material costs. Wave 2 stretch goals are some amazing ships, and I hope we can reach those. If you are unsure about the game then play the PNP, game or at least read the rules, as we plan on adding to the rules as the Kickstarter campaign is going. I have delivered on the Beta Starter set at conventions, which gave a great understanding of what is required to be successful. I understand this the third Kickstarter, but I took my time getting things ready this time. I hope that we see you in Targus’ Skies. Having seen the development of this game, the models, and artwork over the last year, I look forward to seeing how the Kickstarter goes, and wish Derek and the team the very best. 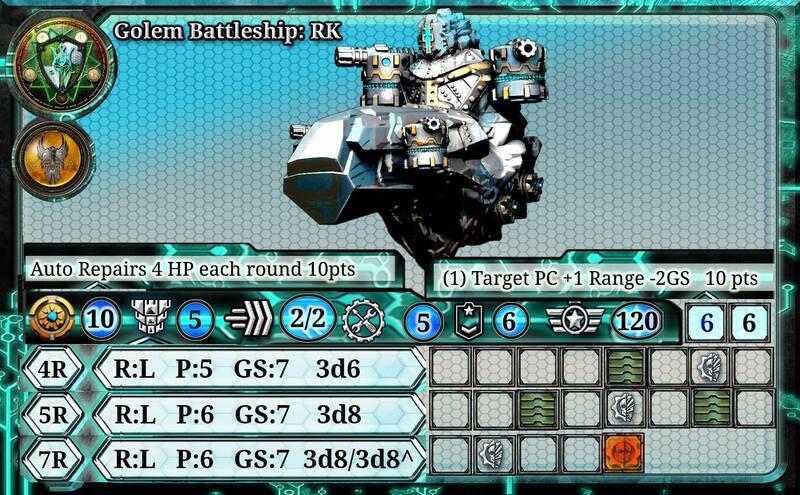 I love ship games, and this one has a hint of anime about it that I don’t think I have seen from other games. If you are intrigued at all by the game, then why not have a look and see what is on offer when the Kickstarter goes live? Well done. I hope they do well with the launch! Certainly. If interest in the Kickstarter matches even half of the effort and passion that Derek has put into the project, then they will do well. Good interview, you asked some of the questions I would have thought of. Looking forward to the launch now. Thanks Rory. I have seen a fair bit of the development of this game over the last 12 months, and between that and having backed the Dropfleet Commander Kickstarter, I think I had a good idea of what was worth asking. This was an opportunity for Derek to give potential backers some confidence in this project, and I am looking forward to seeing it fulfilled.